← HIGHLY RECOMMENDED: elements by Artesa, 2006 Cabernet Sauvignon, AND elements 2006 Red Wine. INTERESTING. Cantine di Ora, 2010 Dry Red Wine, Montepulciano D’Abruzzo, Italy. 12.5%. $11.99. APPEARANCE: Garnet, pink edges. Not clear, not opaque; occult/translucent. NOSE, FIRST GLASS: Dust, typewriter ribbon. Bright raspberry tart. White pepper. Bright high notes. TASTE: Dry tannins, almost mouth-puckering, but round and rich. Silky. Duskier taste than I expected from the soprano notes and raspberry impressions on the nose. A little molasses. Brambles. A little bit of wood—but what kind? Did I love it? No. I liked it some—like a person I’ve just met and can’t quite relate to. But I didn’t dislike it, either, and I know just enough about wine to know that some people will really love this, and some will dislike it. (If you don’t like tannins, stay away.) It was, simply, different. I enjoyed thinking about it, and I enjoyed experiencing it, but I wouldn’t pick it out as my first choice. Clark’s impression: “We should have different naming conventions for Italian wines. The words we use to describe California and French wines don’t work.” I thought that was pretty insightful, at least for occasions like this, when a varietal is unique and rarely encountered. 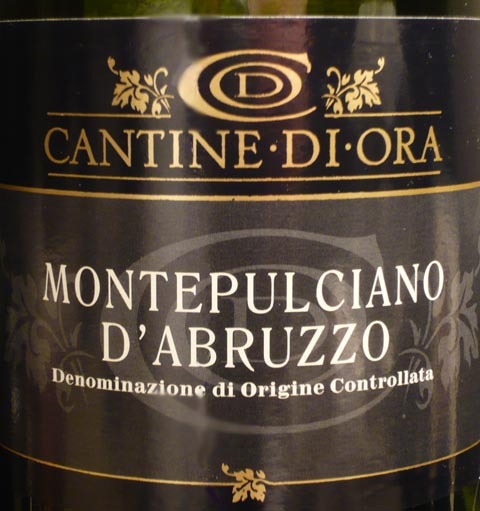 This entry was posted in Italy, Montepulciano D'Abruzzo, Sangiovese. Bookmark the permalink. One Response to INTERESTING. Cantine di Ora, 2010 Dry Red Wine, Montepulciano D’Abruzzo, Italy. 12.5%. $11.99.